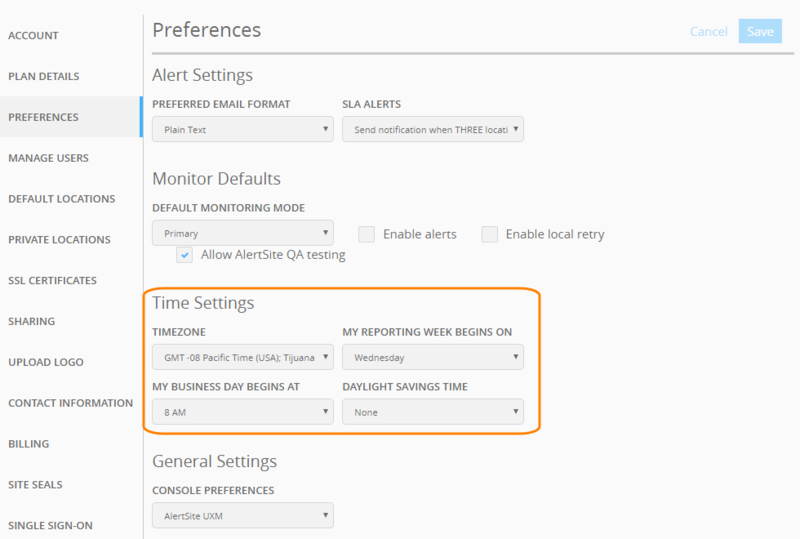 By default, AlertSite dashboards, alerts and reports show timestamps in the UTC (GMT) time zone. You can change the time zone to your local time if you wish. The selected time zone affects all users and alert recipients in your AlertSite account. Note: You must be an Admin or Co-Admin user to change the time zone in AlertSite. Navigate to > Settings > Preferences. Under Time Settings, select your Timezone and the Daylight savings time mode. From the top menu, select Account > Manage Account. In the Preferences section, select your time zone from theTimezone drop-down list. From the Adjust for Daylight Savings Time (Summer Time), select United Kingdom/Europe (Mar-Oct), United States (Mar-Nov), or Australia (Oct-Mar) to adapt the current time of the day. Click Submit Changes at the upper right. For US EST (Eastern Standard Time), select GMT -05 and set DST to United States (Mar-Nov). For Arizona, which is Mountain Time but does not use DST, select GMT -07 and set DST to None.